Do you love the stories of Pooh Bear along with EH Shepherd’s gorgeous illustrations that adorn every page of AA Milne’s classic – The House at Pooh Corner? And what about the the magical map of 100 aker wood, which in the original version appeared pasted across the end-papers inside the front and back covers of the book? It is the perfect example of a pictorial story-map! 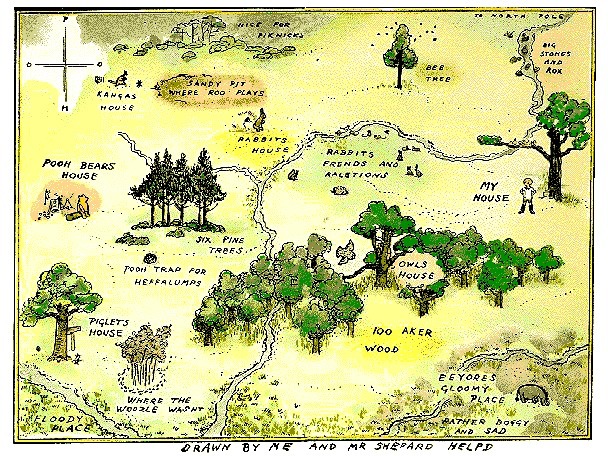 It not only visually illustrates the spatial relationship between Pooh’s home to those of his friends (and some of their relations). where the heffalump trap was set. Drawn by E. H. Shepard, 100 Aker Wood appeared (in black and white) on the endpapers of A.A. Milne’s book, Winnie the Pooh. So he can quietly reminisce and enjoy these moments over and over again (perhaps with a paw in a pot of honey), or show and share the shenanigans with family and friends in years to come and so keep these tales alive… forever. This entry was posted in Maps, NEWS and tagged 100_aker_wood, map, maps_in_literature, pictorial_maps by Linda. Bookmark the permalink. It is so absolutely charming and what a wonderful beginning for Journey Jottings. You’ve taken me back to my own childhood and days of reading to my own children when they were little. From a simple acorn big things have grown!